My weekend started early this past week, Tuesday evening to be exact. 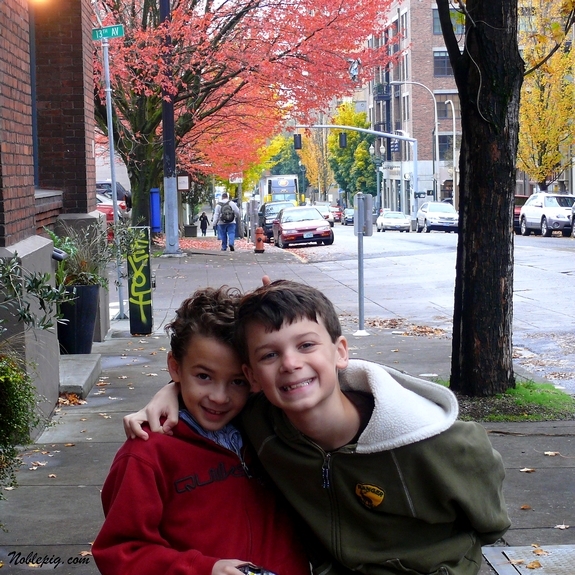 The boys were going to be off for school for three days so we decided to head into the city (Portland) for some fun. We only live 38 miles from downtown but when you live in the country it seems like you are going to another planet, I love that. We stayed at a beautiful, old, sophisticated hotel known as the Hotel Deluxe. 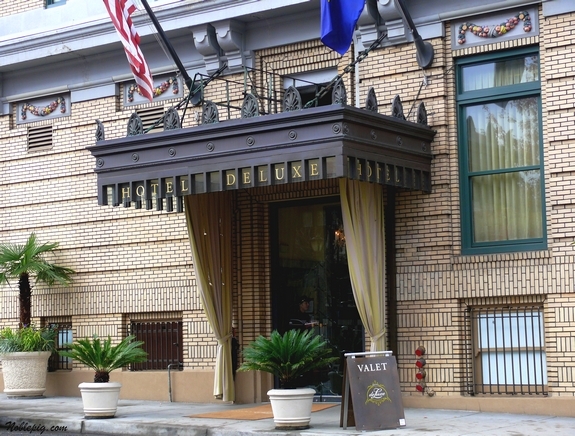 The hotel has been renovated to pay tribute to the Golden Era of Hollywood. Beautiful chandeliers, mirrors and all kinds of fanciness make up this stylistic hotel’s lobby and rooms. When the doormen opened the door as we entered, my boys looked at me and said, “Oh this is a fancy place huh Mom?” Glad they can recognize the difference, LOL. 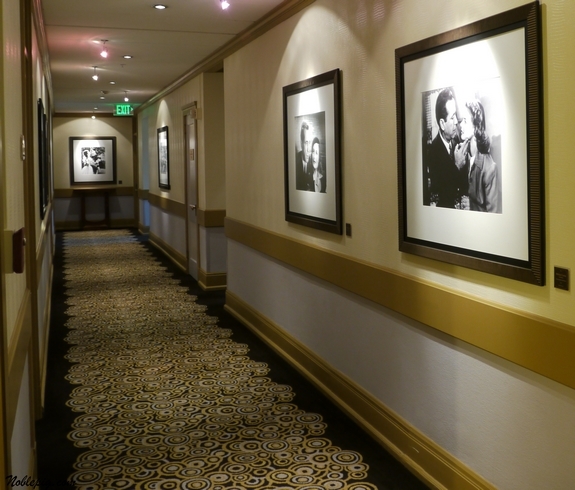 Each floor of the hotel pays tribute to Hollywood director’s of the Golden Age and movie posters from their films line the hallways. 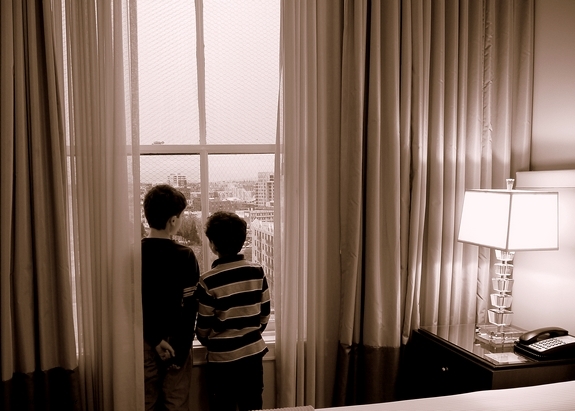 Here are the boys checking out the view of the Morrison Bridge from our window. Our room was nicely appointed, very clean, large and comfortable. The walk-in closet was so big we could all be in there at once. 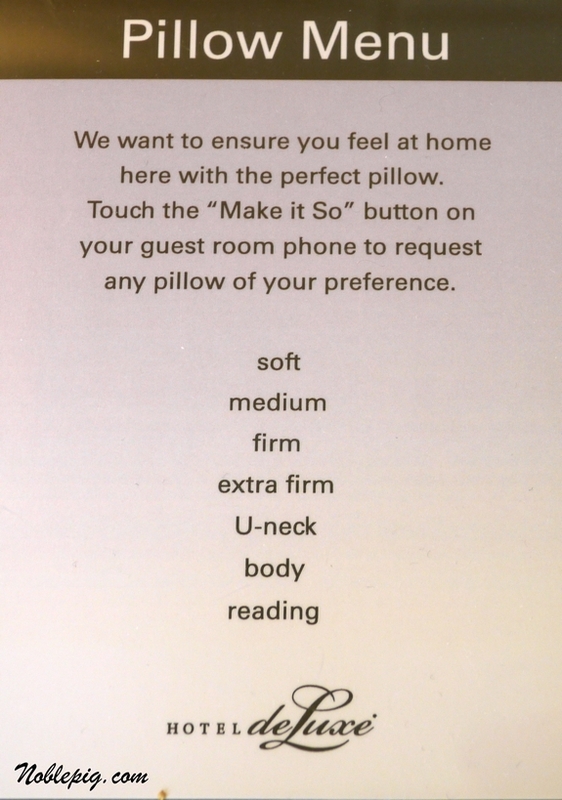 This was the best part, the pillow menu. Yes, we ordered one of each and several others. They brought them immediately and was just awesome as I don’t usually get along with hotel pillows. The hotel also had this next to the phone. 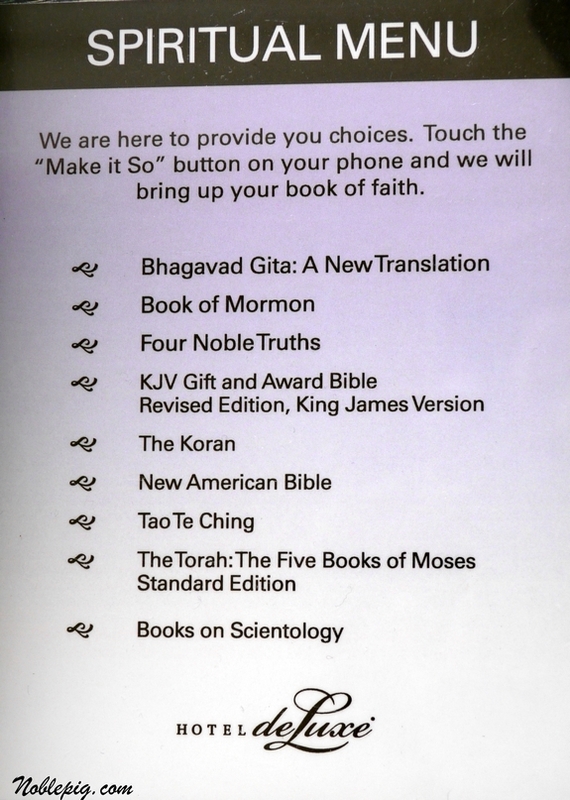 While we weren’t inclined to order from it, I’m now curious what the Four Noble Truths are…need to Google that. We did a lot of walking around, which is what we love to do in the city. Portland is a beautiful city with amazing architecture and charm. You can actually find parking and I have yet to feel unsafe there. I did some damage here. This guy will still pose for me at my request. We had some lunch here. We love Bento!! 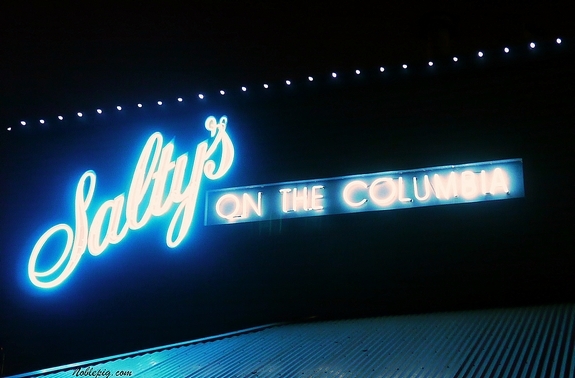 And besides all those other places we ate, we also went to a very nice restaurant called Salty’s on the Columbia. This beautiful restaurant sits on the Oregon side of the Columbia River as opposed to the Washington state side. The Columbia River is what you see when you are landing at Portland International Airport. 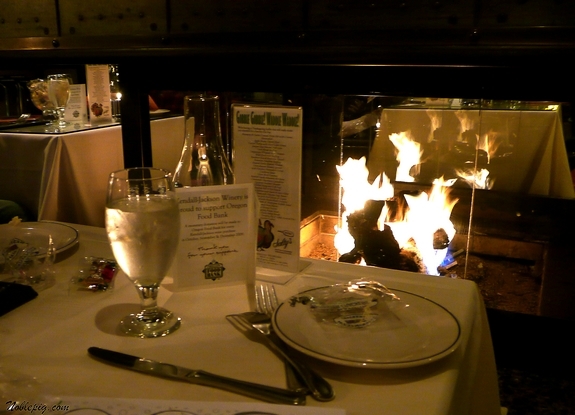 We had a very nice table next to the fireplace. Despite Salty’s being a more upscale restaurant, they completely catered to the kids. They brought them Jello, Goldfish crackers and crayons to keep them busy before dinner. 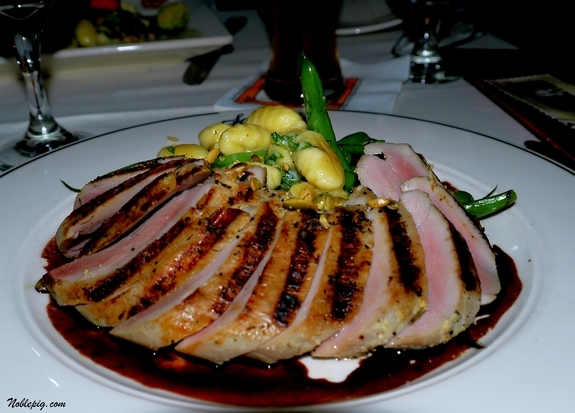 Here is a picture of my Pork Tenderloin built around a Port-Juniper Berry Reduction. It was amazing and I washed it down with some Panther Creek Pinot Noir, a perfect pairing. 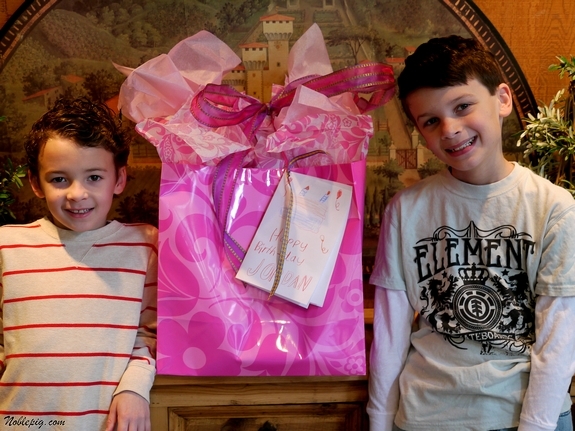 When we returned home the boys had a birthday party to attend. 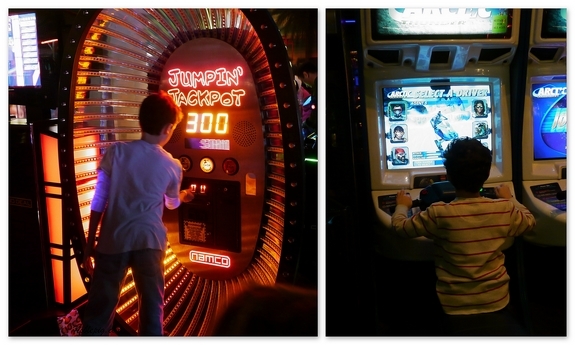 The party was at Safari Sam’s which is pretty much Chuck E. Cheese on steroids. 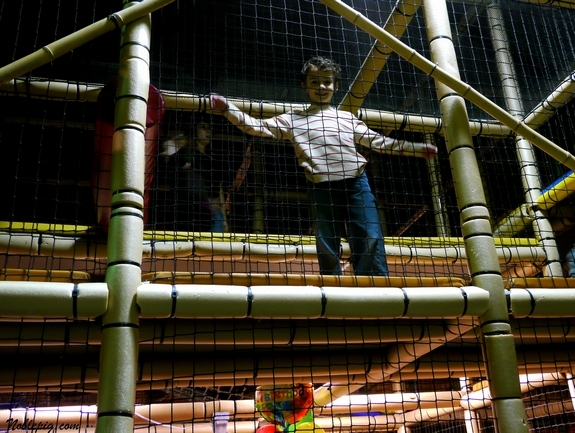 This is the humongous jungle gym that goes all above the party tables. And enough video games to make the kids insanely happy. With his ticket winnings, this guy bought a set of mustaches. Yes, he’s still wearing them. It was a good weekend, how was yours? WOW, my weekend was not as exciting as yours. Portland looks like a very interesting city. Your dinner looked fabulous. I loved the mustaches. It surely seemed like a nice weekend of memories. What a nice weekend you had. I love hotels that are old but are still well maintained. This weekend I took the kiddies to a U-pick farm and we picked pesticide free green beans straight from the vine. They ran from a cow that was also incidentally spooked and running from them…good times, good times. Wow, what a weekend! My daughter and I were drooling over your vacation. 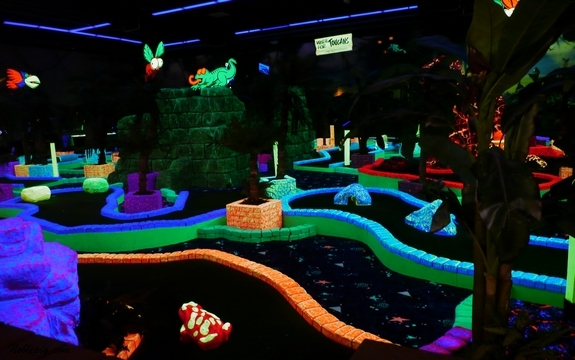 The glow in the dark mini golf is the coolest thing we’ve ever seen. Hi Cathy, The Deluxe is a great choice. I sort of flies under the radar, somehow. Did you check out the Driftwood Lounge in their lobby? Very noir. By the way, your boys are so handsome! I love your recent weekend updates. So fun! The hotel sounds awesome! It ALL looks so great! I wanna go on a staycation! Love the hotel pillow menu! Oh, and love your funny sons and the mustaches are awesome! Your weekend looks like it was so much fun, but those fake mustaches? Single best part of the weekend, hands down. A pillow menu??? Ohhh my!!! This is totally and completely the perfect hotel for me! Thank you for featuring it on your blog. I will keep it in mind for our next trip to Portland! What a wonderful early weekend, love to visit Portland one day. Beautiful hotel and pretty unique. Sounds like you guys had a great time in Portland! 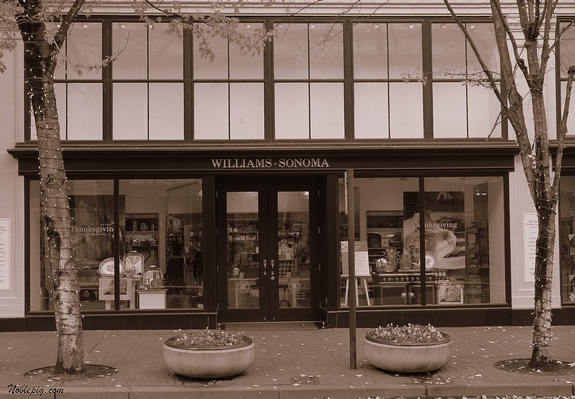 I shopped around Williams and Sonoma myself last Tuesday. 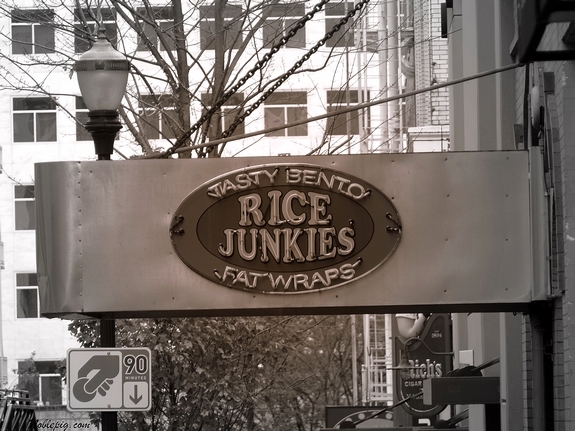 I don’t shop in downtown Portland that often but I had a great time and had to wonder why I don’t do it more often. And thanks for the hotel review. It sounds like a wonderful place to stay! Pretty quiet here. Took a drive up north for a quick day trip on Saturday. Your photos are yummy on this post. I love the sepia toned hotel shots and all the street scenes. What a beautiful city. FABULOUS hotel!! I always loved weekends away in new places with my chidren. Now they are all grown and have travelled the world themselves I still love them. You look lke you had a wonderful time and the sepia touched photos are fantastic. Cathy, what a fabulous getaway. The boys look like they had a wonderful time. The Four Noble Truths are the core of Buddhist teaching: There is suffering. There is a cause to suffering. There is an end to suffering. The is a path out of suffering. Terrific photos. Sounds like you had a wonderful weekend. Don’t you just love Portland? 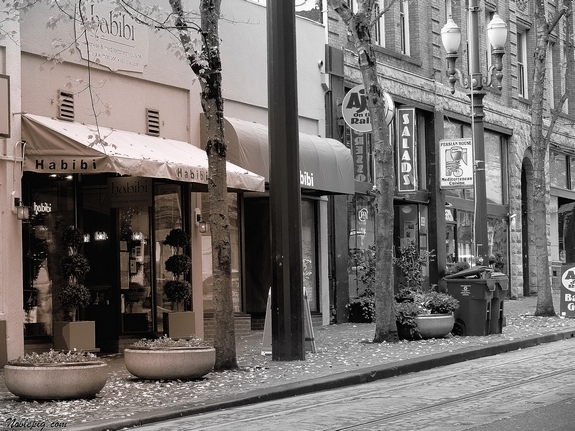 I love Portland too…it’s so much fun to wander around all day. I still haven’t tried Salty’s – it’s on my must try list. Next time you visit the city try Lucy’s Table – it’s amazing! Your photos are beautiful! Your kids are so cute! What a great weekend. Love that tenderloin and the pillow menu…how stinkin’ cool is that along with the whole premise of the hotel. The boys are adorable as always. We miss you guys too!! I love Portland. It is the one and only big city I will drive too, and around in, by myself, without a panic attack. It is beautiful and mostly friendly with so many wonderful small towns and scenic areas surrounding it. Looks like my kind of weekend, and your hooligans are so cute, how blessed you are to have days like this with them. What a lovely time you had…was that pork tenderloin just for one person???! What a great weekend. Our family loves traveling. It is so much fun to stay at random hotels. Great pics! Thanks for sharing. OMG! This all just too much! The hotel, the pork, the colors of fall, the pics of the kids. I’m totally awake now. And, I want want to play Glow-In-The-Dark miniature golf!!!!! OMG, I would love Safari Sam’s!! …also, that portion of pork tenderloin is huge. Wow, what a cool weekend. Love the hotel and all the cool city photos. Your boys are so cute too! Oh Cathy, love your pictures! The hotel and that pork looks amazing!! The boys are so cute and the mustache is too funny! So glad you had a great weekend! Your family takes the most interesting trips. That hotel looks like a blast – I think I would have ordered one of each of the books just to see what they were all about! 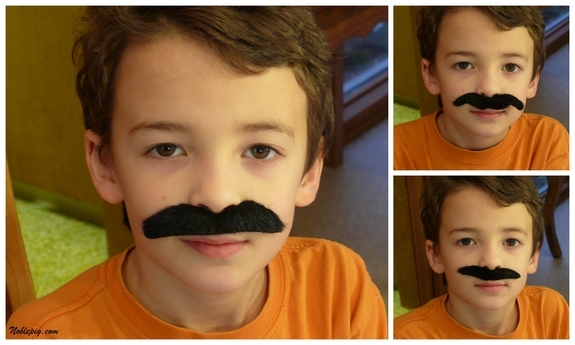 Those mustaches – practicing for later life! What fabulous pictures. At the risk of sounding like a broken record, I love Portland too. The hotel’s amazing and as for the boys – well, can we borrow them?? They look like so much fun! A hotel with a pillow menu? Yeah that’s for me!! I love restaurants that cater to kids. In Florida, other than close to the House of Mouse, they’ll fall over themselves to help seniors, but bring a kid into a restaurant, and you might as well be toting along an alien being. High chair? Yeah, we might have had one of those back in 1945. Got disposed of to help the war effort. I don’t go to Florida much. 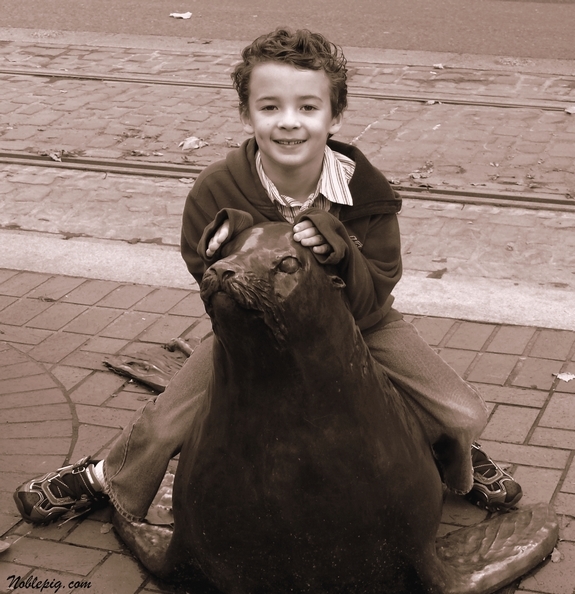 I like your black and white and bw/sepia photos. They are nice. And I’ll go for the hotel with the pillow menu. That’s even better than room service (and I’ll bet that was awesome, too)! What a fun time for you and your boys! The hotel looks great and the food wonderful. I’ve never been to Portland. I think I’m missing something! ok now that is my kind of hotel with a pillow menu. tell me there were big old fashioned bath tubs? wish there were more pics of the bento. Oh boy! I want to visit Portland! Looks like a lovely city, and looks like you had a lovely weekend. Oh, gosh! What a great weekend. you can watch the planes coming and going from Portland Int. Looks like so much fun. Love the pillow menu! 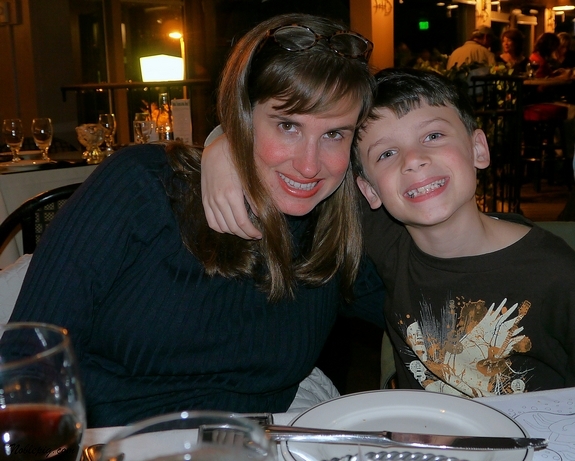 I’ve eaten at Salty’s on Alki a couple of times, they do an amazing brunch on Mother’s day! Those mustaches made me laugh out loud! Oh that looks like the perfect weekend. I love the hotel and all it’s choices! Your kids are adorable! Love the glow in the dark golf! What a great idea. I’ve been to the Hotel deLuxe before and one of these days I am going back. It’s an amazing place with the most wonderful ambiance and awesome service! 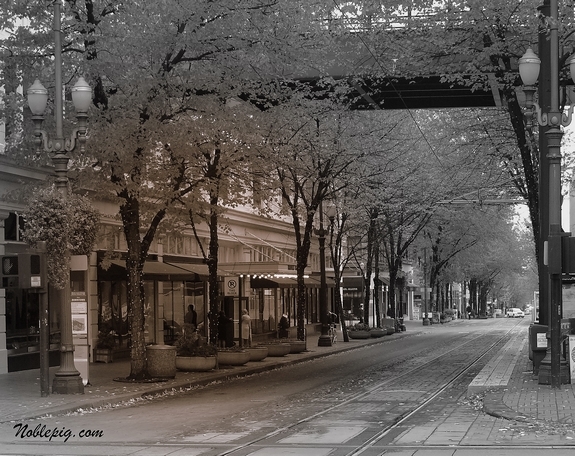 I’ve never been to Portland so I really enjoyed taking a little virtual trip via your blog! It looks so quaint – not at all as I had assumed it to be. Thanks for sharing! I love your blog, I check it regularly! Your son’s are absolutely adorable!! Can I request some vegetarian dishes? That street is beautiful! I would love to go for a stroll and check out the local merchants. LOVE THOSE MUSTACHES!! So cute! Beautiful pictures of Portland! We only live 10 miles away but don’t go as much as I’d like. We do like the restaurants. I like your mini-vacation idea. The personal loans suppose to be useful for people, which would like to start their own career. As a fact, that is easy to get a student loan.